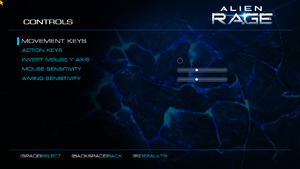 Single player configuration files are encrypted. Open the editor and go to the configuration file(s) location. Open the file you need to edit and make your changes. Delete or rename AR_CI.bik and AR_CI_UNREAL.bik. Delete or rename AR_CI.bik and UE3_logo.bik. Use Flawless Widescreen to fix single player weapon FOV and HUD centring. Use Flawless Widescreen to fix single player weapon FOV. 85-120° for single player; 75-94° for multiplayer (multiplayer shows no numbers). 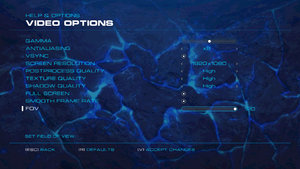 Uncheck Smooth Frame Rate for single player (off by default for multiplayer). 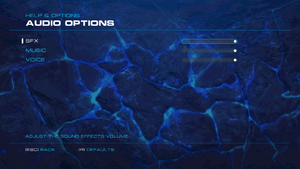 Delete cannot be bound to commands in-game and must be set in AFEARInput.ini. 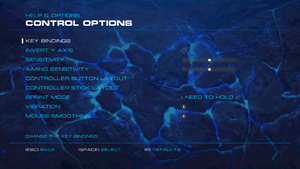 Toggle Mouse Smoothing for single player (for multiplayer set in ARageMPInput.ini). 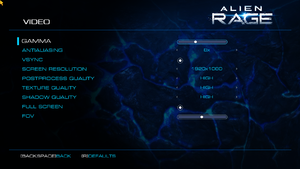 Use Helix Mod: Alien Rage. ↑ 1.0 1.1 File/folder structure within this directory reflects the path(s) listed for Windows and/or Steam game data (use Wine regedit to access Windows registry paths). Games with Steam Cloud support may store data in ~/.steam/steam/userdata/<user-id>/217920/ in addition to or instead of this directory. The app ID (217920) may differ in some cases. Treat backslashes as forward slashes. See the glossary page for details.